Shouldn’t Christians study prophecy? How then can studying prophecy hurt a believer? Jesus was asked about the destruction of the temple and the end of the age or the time prior to His return, so in Matthew 24 He gave some signs that would be occurring before His return. He said, “For many will come in my name, saying, ‘I am the Christ,’ and they will lead many astray. And you will hear of wars and rumors of wars. See that you are not alarmed, for this must take place, but the end is not yet” (Matt 24:5-6), but there’s more, as Jesus says, “For nation will rise against nation, and kingdom against kingdom, and there will be famines and earthquakes in various places. All these are but the beginning of the birth pains” (Matt 25:7-8). If you watch the news, these things have already been happening with increasing velocity, so it would appear that Jesus’ return could be soon, but He did say, “These are but the beginning of the birth pains,” so it will only be when “this gospel of the kingdom will be proclaimed throughout the whole world as a testimony to all nations, and then the end will come” (Matt 24:14). Is that time near? Possibly, but one thing we know for sure, no one knows the day or hour (Matt 24:36), so must we be students of Bible prophecy? Is that our mission? Jesus said to go into all the world and make disciples of others, teaching them the same thing that He taught His disciples (Matt 28:18-20). This is given as an imperative command or a non-negotiable. Today, what Jesus taught His disciples can be found in the gospels and elsewhere in the New Testament, so the church is commanded to make disciples of all nations, to teach them what Jesus taught His disciples, and to love one another. In fact, Jesus places great emphasis on loving one another, as an apologetic, or as a way in which people can know if we’re His disciples (John 13:34-35) or not. Our Lord and Master also give us marching orders to feed the poor, give drinks to the thirsty, visit the sick, those in prison, and make strangers feel welcome (Matt 25:34-39). The way Jesus sees it, if you did it for others, you did it for Him (Matt 25:40). Jesus’ brother James said that pure religion is keeping ourselves unspotted from the world, and to visit the orphans and widows in their afflictions (James 1:27). That means visiting those in hospice, the hospital, the nursing home, shut-ins, and in prison, because the vast majority of these people are orphans and widows. These are the things Jesus emphasizes for the believer, and corporately, for the church, but what about prophecy? Shouldn’t we be keeping a close eye on that? I am not arguing that we shouldn’t be spending time studying world news, events in Israel, and trying to see how these things fit into biblical prophecy. There’s nothing inherently wrong with these activities…unless they begin to take the place of our studies on Christ and doing what He commanded us to do. We must not only be hearers, but also the doers of the Word, and that means doing those things which God has planned for us to do before we even existed (Eph 2:10). I have not found a command to “go and study prophecy” in the New Testament, but I have found several commands to preach the gospel and be the hands, eyes, feet, ears, and mouth of Christ. If the proportion of time spent on studying prophecy exceeds that of studying about Christ and God, then our priorities have shifted to things which Christ doesn’t emphasize. The Olivet Prophecy was not designed to be a “count down” to Jesus’ return. It was to be a warning to the church so that they might know the time is near, and I’ve read enough Bible prophecy and Jesus’ prophecies to know, the time does seem near, but the nearness of His return doesn’t change the priority Jesus gives us (John 13:34-35; Matt 25:34-30, 28:18-20). In fact, the times we live in should compel us to be Jesus’ witnesses more fervently than ever. Jesus said “stay awake, for you do not know on what day your Lord is coming” (Matt 24:42), so “you also must be ready, for the Son of Man is coming at an hour you do not expect” (Matt 24:44). Even prophecy buffs can’t figure this out. Jesus said He’ll come when no one’s expecting Him, and no one certainly includes students of prophecy, so nobody knows the time of His return, and He’ll most certainly come when nobodies expecting Him. No amount of Bible prophecy study or knowledge can pin down the time of Jesus’ return. how to live a holy life, as much as is possible in the Spirit (1st Pet 1:15-16). Prophecy is very interesting, but it can overshadow what’s important, and that’s to know Christ and share in His sufferings, and to share the gospel, but above all, to glorify God. Studying prophecy doesn’t get all these things done as well as studying the Book of Philippians, Romans 5, and the Book of Galatians which show us the heart of Christ. No one has ever been saved to my knowledge by understanding Bible prophecy. Our church often gets off on a tangent in Bible study and Sunday school. All of a sudden we’re chasing too many rabbits down a rabbit hole, and can’t shoot one of them. The subject is forgotten and the study begins to deviate into personal experiences. Personal experience is fine, but it’s not the Word of God. We can only grow in the grace and knowledge of God by time in the Word, the Helper, Who is the Spirit, and focusing on the God-Man, Jesus Christ. When the Holy Spirit came, He always pointed the church to Jesus Christ. The Holy Spirit rarely focused on prophecy, but rather focused on Jesus Christ, in the hopes that we might die to self and live for Christ. 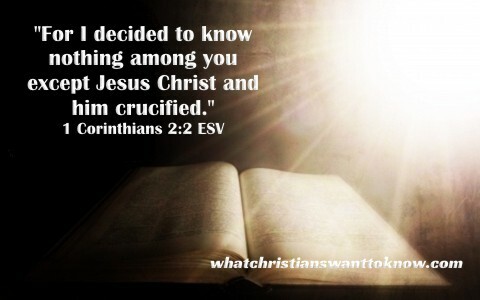 Nothing in Bible prophecy compares to knowing Christ and Him crucified. The Apostle Paul had it right: “For I decided to know nothing among you except Jesus Christ and him crucified” (1st Cor 2:2). “At the Cross, at the Cross, where I first saw the light”!! Thanks Doc. So good to hear from you my friend. Yes, well put JW, and backed by scripture.